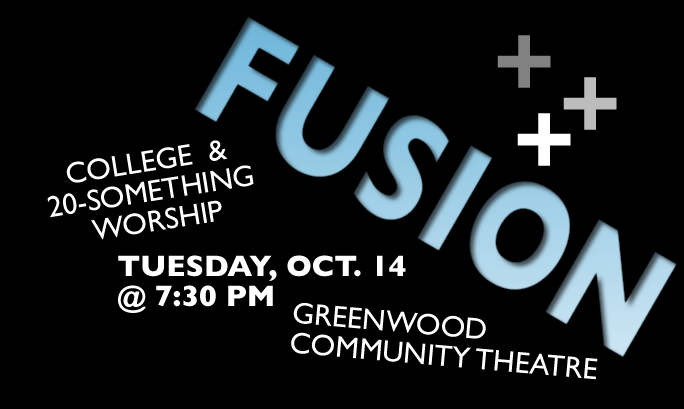 Don’t forget to come out to Fusion tonight at the Greenwood Community Theatre at 7:30. All college students and 20-somethings (as well as people who like to minister to this group) are welcomed to come out for an awesome night of getting our praise on. So, you definitely don’t want to miss out – if you can’t come, please pray, it’s going to be a special night tonight! I’ll give you a report tomorrow. If you need to invite a friend, you can do so here.